Group Equipment and Matwork classes are a FUN way to get a great Pilates workout with other participants. Because of our dedication to our Pilates Principles Course, participants of group classes are prepared for pacing and intensity appropriate for their Pilates experience. Through the individualized attention of the Course, new participants are prepared with modifications, if needed, when they are ready to join a group class. This keeps the flow of the class moving and no one feels excluded from a particular exercise. Please discuss your level of knowledge and experience with Pilates with one of our instructors prior to signing up for any classes higher than the Essential or Combined level. This allows for safety for all involved as well as provides each participant equal attention from the instructor. Group class sizes are limited to the equipment available, so participants must sign up in advance. Matwork is the heart of Pilates, and typically what most people think about when they hear the word Pilates. Here you will build upon the STOTT PILATES Five Basic Principles foundation exercises included in the homework of the Pilates Principles Course, and start building coordination, balance, and muscular endurance. Don’t be fooled– this class isn’t an easy stretch class! This mat-based workout is designed to help participants establish core strength and stability, that supports the rest of the body in daily movement, and heighten mind-body connection and awareness. We utilize the springs and bars form the Vertical Frame to enhance various exercises and add diversity of programming. This is unique to a group matwork class, and something that sets Aspire Pilates matwork classes apart from large classes at the gym. Additionally, small props are used to modify exercises for those who need it, or to take an exercise to a greater challenge. Class capacity is limited to 6 participants for maximum instruction and attention. 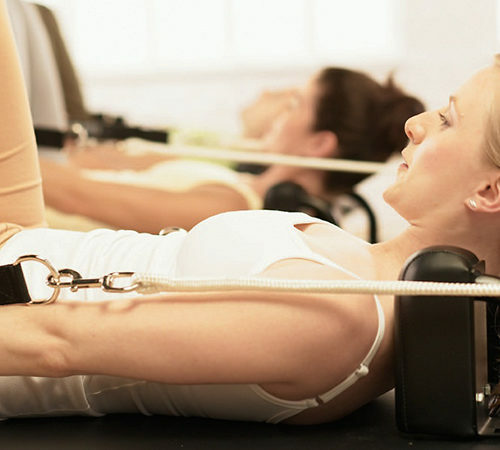 Group Equipment Classes include a variety of Pilates equipment- Reformer, Vertical Frame, and Stability Chair. As there are hundreds of exercise options for each piece of equipment, no two classes will be exactly the same. Pilates equipment utilizes spring tension to create unique strength challenges not found with typical gym equipment. Add the additional challenge of stabilization, balance, control of movement, and coordination and the possibilities are endless- as well as the challenges. Once the principles of Pilates, and the essential level exercises, have been introduced in the Pilates Principles Course, participants are invited to join a group class to refine and perfect those exercises while building strength, endurance, and increased challenge. This allows the class to flow on a similar level of understanding, yet appropriate modifications or challenges made for each participant. Please read more about our Pilates Principles Course under the Programs tab, as this is a prerequisite for those new to Pilates before attending Group Equipment Classes.